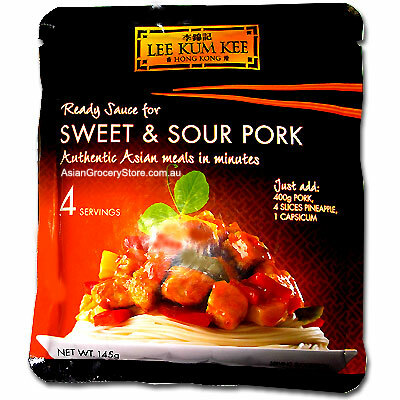 Minimum quantity for "Lee Kum Kee Sweet & Sour Pork Ready Sauce" is 2. Sweet & Sour Pork . Chinese restaurant around the world go to great lengths to balance the flavours of sweet with sour. Now you can make authentic-tasting Sweet & Sour Pork using Lee Kum Kee's Ready Sauce and a simple 3 steps batter stir-fry method. Serve with freshly prepared noodles or steamed rice. Authentic Asian meals in minutes. White Sugar, Water, Corn Syrup Powder, Rice Vinegar, Tomato Paste, Concentrated Pineapple Juice(4%), Concentrated Lemon Juice(4%), Salt, Modified Corn Starch, Acid (260), Spice, Acidity Regulator (331), Colours (160c, 160a ), Stabiliser (415). Contains Soybean, Wheat.